I am in a celebratory mood. And why not? Fall is in the air; I ate a honeycrisp apple today; and yesterday I made a new blogging friend. In person. And it was glorious. Searching WordPress’ recommended blogs, I discovered a gem called Go Jules Go. I visited said blog regularly, chuckling at Jules’ antics and admiring her positive spirit and excellent speaking voice (thanks to her video blogs). In a twist of fate and slap bracelets, Jules and I began emailing. She’s just as hysterical via email as she is on her blog. An example from a recent email: “I’m sorry if the font size on this email is screwy. I don’t know what the heck is happening with my email lately, but every time I start a new paragraph, the font gets bigger. Is it like a hint that I should shut the hell up? Well. Screw you, Yahoo! Everyone makes fun of you, you know. Having you as an email carrier is like still having a pager.” And this nugget: “The last time I ordered a mimosa…I asked them to hold the orange juice.” Jules is a riot. We met at Cheesecake Factory. As you know, a locavore is not at home in this establishment. At all. But due to its convenient location to the highway, it was the perfect spot for a bloggy friendship to bloom. And bloom it did. First we exchanged gifts. My very own ‘Stache Glasses!! With bling no less. Jules gives these marvels away FOR FREE just for answering a thought-provoking question she poses. As far as I can tell, the most ridiculous answer wins. She also wears them to work everyday (I like to think that anyway). This is my blogging mentor. On another note, notice the woman in the background. Clearly she’s overwhelmed by the 300-page menu. She’s giving it the stink-eye. My present to her was a labor of love. A card carefully crafted with scrap book paper, a sharpie, and a highlighter. 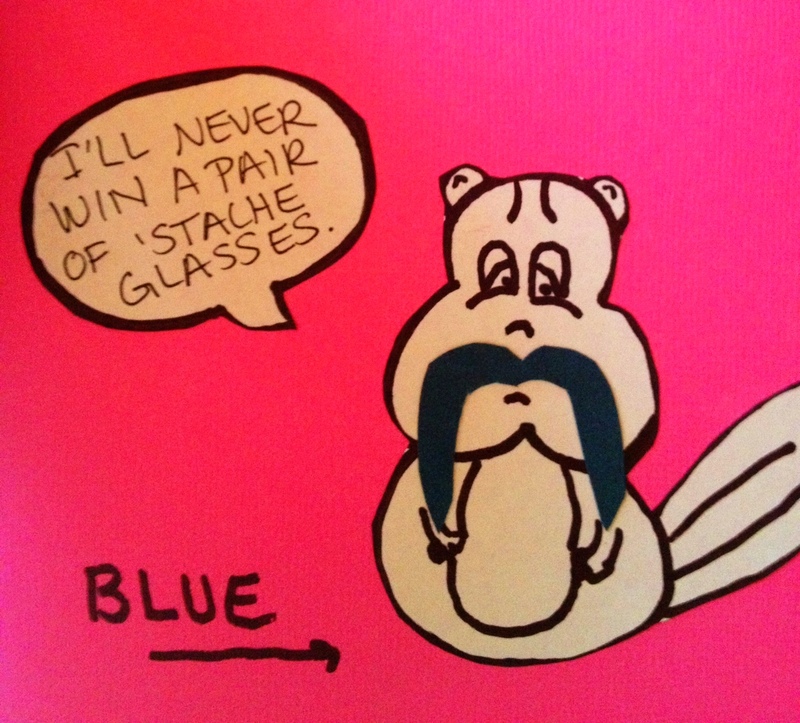 Yes, this is a chipmunk with a blue mustache. If you keep up with gojulesgo.com, this will make perfect sense to you. After squeals of delight over our gifts, Jules and I celebrated our new-found friendship by ordering mimosas without orange juice and egg rolls with avocado. I’m not gonna lie. Those egg rolls were the so-not-local-bomb. 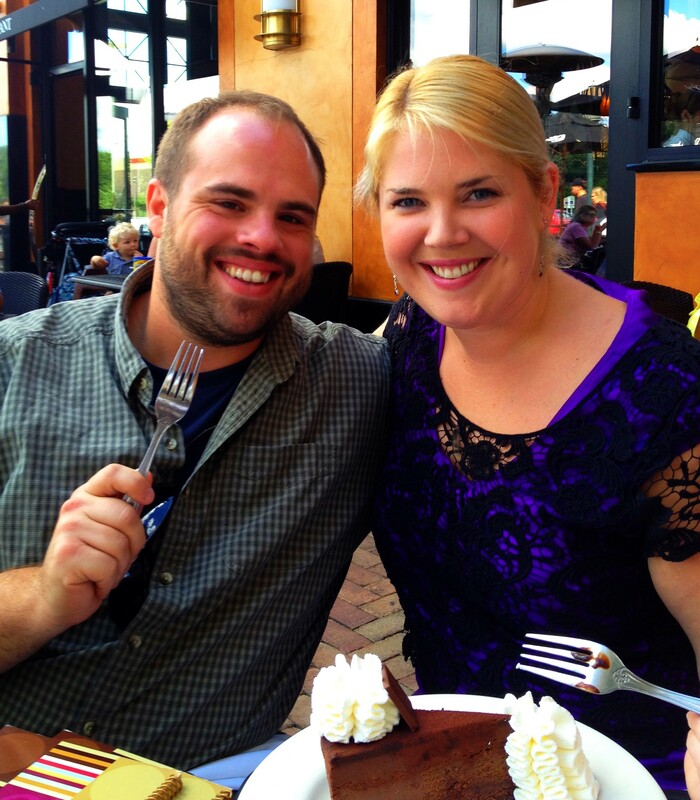 Jules and I wondered just how the Cheesecake Factory peeps do it. So crispy and warm on the outside with perfect, not-mushed-up avocados on the inside. Falling off the locavore wagon for one afternoon was worth it for the few hours of delightful conversation and bloggy bonding that occurred over those avocados, cheesecake and champagne. 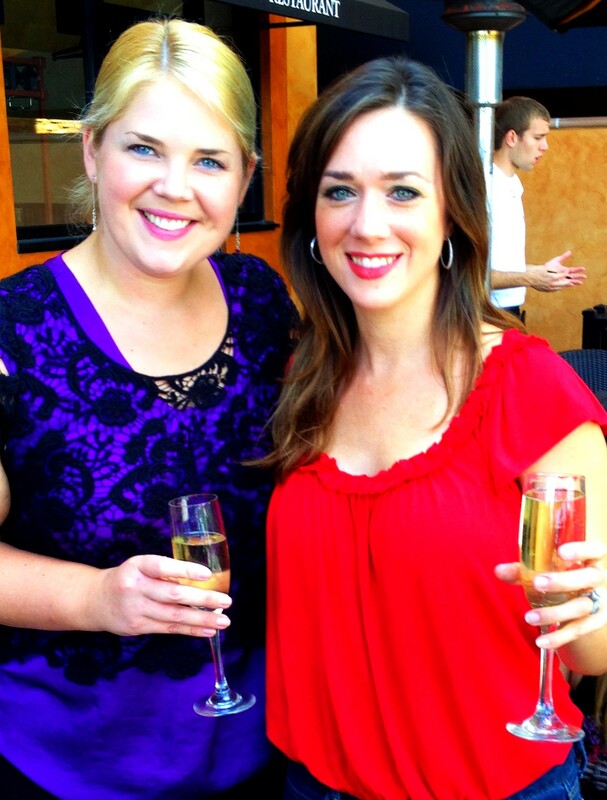 So now I’m raising my glass to Jules and toasting all the blogging inspiration and advice she has given me. 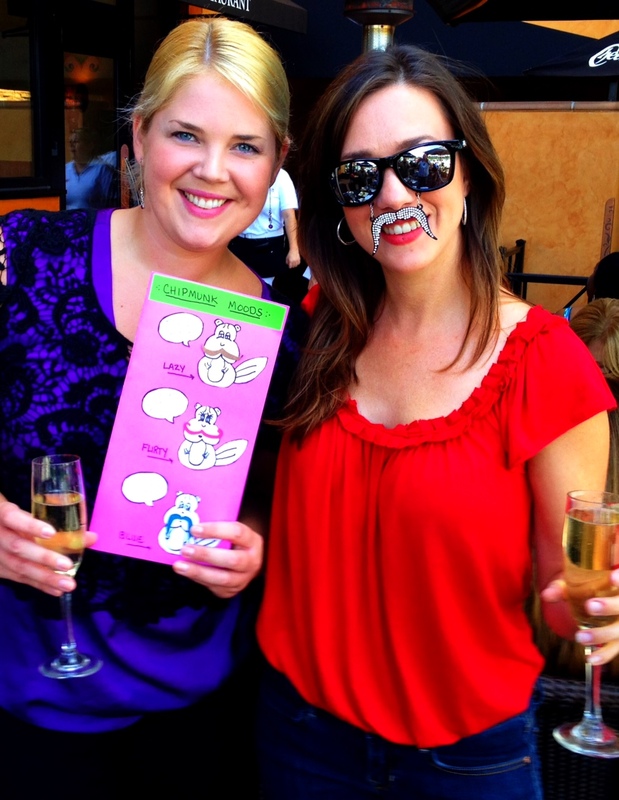 Cheers to you, Jules, and to meeting in real life! Orange-juice-less mimosas are so refreshing! TWO new friends! How cute are they? P.S.S. – Can’t get enough of those ‘stache glasses? Head over to Go Jules Go for more photos and frivolity. First of all, Rache, if I didn’t already admit to myself how much I love you, I have now, after seeing your generous photo cropping/selection/filter application of the walking dead. This is what true friendship is, no? Will it creep you out to know that I keep your card next to my lap top so it remains visible at all times, since I never leave my lap top, ever? Peppermeister is soooo excited to see what you’ve got cookin’ with ‘da peppers! You are a true chipmunk. P.S. – Of course I wear them to work every day. I’m going to imagine that all day. YES! You must keep your card with you at all times, just as I have been wearing my ‘stache glasses everywhere, even to bed. ALL the photos we took were lovely–I mean, come on, look at us. We are fantastic. 🙂 We make quite the complimentary pair of friends. Oh, I think Peppermeister will be very pleased. And remember: always hold the orange juice! I’m getting this post tattooed on…well you’ll just have to wait and see. Do you think maybe we’re just too much for the blogosphere to handle at once? Can you imagine if I’d REMEMBERED my ‘stache glasses?? I think it’s best they stayed at home. WordPress may have imploded. Super fun post! I’m jealous to hear of yet another blogger-meets-blogger escapade. I wish I had been there too! I’da taken way more pictures. You two are just too stinkin’ cute. Bad influence looks good on you. Shannon, I would have shared my ‘stache glasses with you. Although I know Jules would have brought you a pair. I feel like we need to have a bloggy weekend sometime in the future. 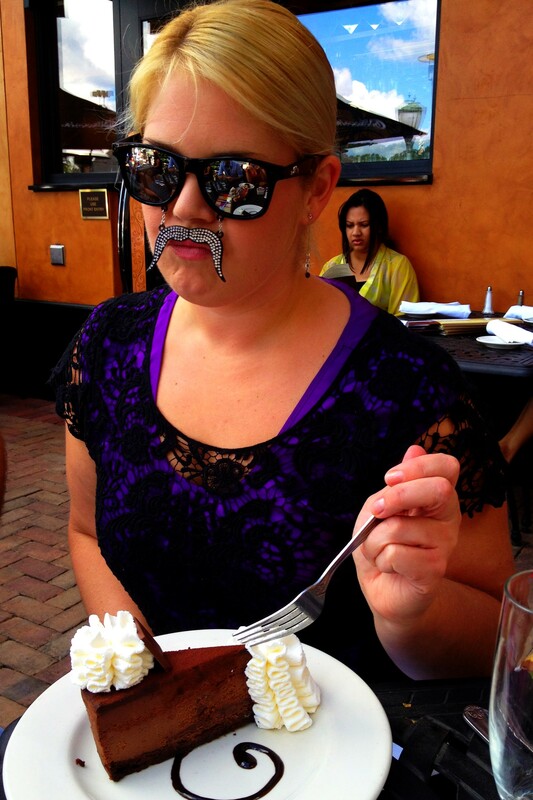 We’ll get Angie a pair of ‘stache glasses too! I guess I need to start working Jules for my very OWN set of glasses. She’s a pushover (but I didn’t tell you that). Wow, the last sentence is almost foreshadowing of my post today. This is fun. F.U.N. I do not own cool glasses. I’ll just have to admire yours. Thanks, Heather! Maybe you will win a pair in one of Jules’ contests! Great post Rache! Thanks for posting. Now I’m going to have to find a fun, blogging friend out there. Good idea! haha… is there an application process with her? LOL. love the interchanges between you too. cool stuff! You just have to look good in a pair of ‘stache glasses. Rache fails to mention the application fee, but I forgive her, because she slipped in under the wire. I now require 1 live chipmunk and Darren Criss’s cell phone number before reviewing any new applications. Unless I just so happen to like the cut of your jib. In which case all bets are off, and you’ll just have to live with me talking about your jib for the rest of your life. Everybody always forgets to mention the fee! Ugh! I don’t have Darren Criss’s cell number, yet. I do have some toenail clippings. Word on the street is that you collect those? Chipmunk is in good condition though he’s not a fan of UPS shipping. Go figure. Sorry, Jules! Rod seems like a nice guy, but I’m not sure where his jib is. Is my jib okay? Rache, I can’t quite make out your jib because it’s covered by cheesecake and a life of lies. Rod, are you far from Jersey? The chipmunk will have to be hand delivered. In lieu of Darren’s cell phone number, I will accept cheesecake. Ask Rache where to get the best non-local kind. Life of lies? Harsh words. I guess my jib doesn’t have a poker face. I enjoy the stink-eye woman in the background. She looks like an angry extra in our film that was told she’d have a speaking part and was downgraded to “overwhelmed customer”. My stink-eye for that menu is so fierce, I don’t even look at it, I just turn to Julie and ask “what am i getting?”. Thank you for noticing my clever comment. That menu is redonk!! You are smart to trust Jules. I don’t think she’d ever steer you wrong…right?? This makes me feel all warm and happy inside — like I just had a mimosa and 86’d the orange juice. What love here! You all are too cute. I want to swaddle you all in receiving blankets and throw you over my shoulder. That’s how cute. Now I need to go stick my face in an avocado. And I, too, can confirm that Jules is just as funny no matter what archaic platform she’s working from — yahoo email, greeting cards, stone tablets, etc. Angie, she is SUCH a riot! Her quick wit and bubbly attitude will take her far in life. And that is not foreshadowing; that is TRUTH. Jealous of you two getting to meet! AND I just noticed you tagged this ‘i heart jules.’ Maybe THAT’S why that woman has the stink eye? Two people meant for each other like us will always make the less fortunate jealous. She should have ordered the avocado egg rolls; they solve so many problems, even stink eye! Make sure you have some burp cloths with you. Jules has downed about five mimosas sans orange juice. Okay, when you put it that way…I’ll settle for putting her in the swing. Ang likes to bring up “swinging” a lot with us, Rache. What do you think it means? Also I love you both. And it was 6. 6 juice-less mimosas. I must have lost count with all the swinging and burping to distract me. Since Angie mentions it so much maybe we should invite her next time? Honeycrisp apples are here? SWEET! They’re my favorite. Jules rocks. And so do you. Thanks! 🙂 Jules is my hero! haha. Honeycrisp are hands down my favorite.